The new ‘Man of Steel’ trailer is out, and it looks mighty good. And, truthfully, it couldn’t come at a better time. The problem with ideals is that once you establish them, the people who “stumble” will be on full display for all the world to see. The smart stumblers don’t like that. And so, over the years the purveyors of popular culture have sought to do away with ideals, hoping to hide their fallibility in the process. The easy wrong is always more popular than the hard right, and millions of Americans are seeing that over time too many easy wrongs only lead to heartache and despair. The United States as a whole is culturally lost, and a well-made Superman film just might get a few people to look for ways to right the ship. Regardless, when trying to make sense of a world where lunatics detonate bombs amongst throngs of innocent civilians watching a marathon, we need not go to the movie theater to find a hero. They’re all around us if we’re willing to look. 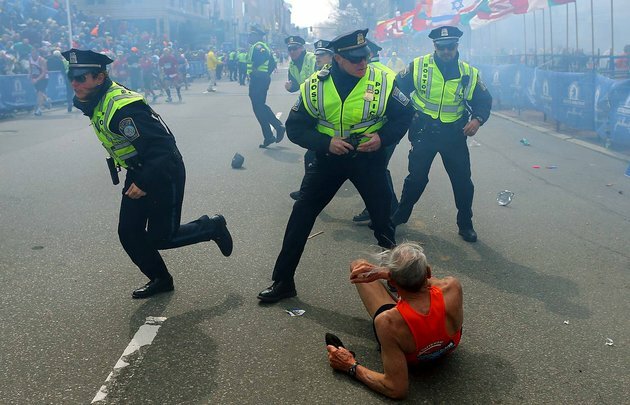 On Monday, April 15, The Associated Press’ Jonh Tlumacki responded to the Boston Marathon terror attack not by running for his life, but by freezing; he then captured the men and women who spring into action when disaster strikes. It’s an amazing photo, one that shows just how instinctual it is for some individuals to protect and defend their fellow citizens during a time of crisis. There are always those who run away from danger — and those who run towards it. Those who run toward the flames aren’t inherently better people than those seeking safety, but at the same time a healthy civil society holds its law enforcement personnel in high esteem. It’s sad that even in the initial moments of such a gruesome event that there were newscasters who chose to speculate in divisive and sick ways. Only seriously warped minds would watch a bomb blast that left three people dead and scores wounded, only to wonder how the political calculus of it all would play out. Regardless, if you see a cop, a fireman or and EMS working in the near future you might want to stop them and say “thanks” just like you would a soldier returning home from overseas. Given that modern day terrorism has erased the traditional definition of a battlefield, it’s increasingly likely that local authorities will find themselves caught up in the fog of war. Luckily, we have men like Mr. Tlumacki who are willing to chronicle the heroics. This is going to be an awesome movie. Definitely light-years (no pun intended) better than Superman Returns. And I’m glad it features a villain other than Luthor for a change.